A Quiet Corner: Finding "A Quiet Corner"
I can't even begin to tell you about the number of houses that we looked at. As I mentioned a while back, the Pres was really impressed with the young builder when we met with him that day at the building site. Since the Pres built houses in between "playing firefighter" back in 1802, he really has the expertise and know how when it comes to construction, so he knew what to ask and understood all the answers. When he learned that this house had Architectural Shingles compared to Standard Three Tab, he knew that we would be "golden," since they are typically good for 30-40 years. When he learned that this house had six inches of insulation in the walls and twenty inches in the ceiling, he knew we would be "golden," and protected from the elements. When he learned that the heating and cooling system was a Geo Thermal Vertical Ground Unit with it's own well, he knew we would be "golden," being extremely energy efficient and cost effective. 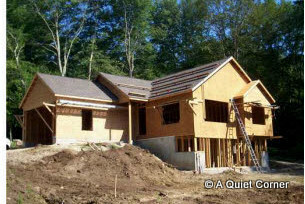 The list was not only initially endless, but also continued to grow each time we spoke to the builder. Red Oak flooring throughout the house, with the exception of the two bathrooms, which will have ceramic tile, was part of the original specifications as well as many other unique trademarks which are the builder's "signature". This builder has worked in the industry since he was fourteen, which is when he began working with his father. He is President of his company, which is renowned for energy efficient home construction. Both the Pres and I knew that now that we are in our "golden years," we would be safe, snug and secure in such a home. Our focus had been on the Northeast corner of Connecticut all along. Once the offer was made, I "Googled" the county and town in which the house is being built. "...known as "the quiet Northeast corner", Windham County is primarily known for its serene countryside and abundant dairy farms..." That, my friends was AFTER I'd changed the name of my blog from Home in the Hollow to "A Quiet Corner." I think it was just meant to be. Here was the pot of gold we'd been searching for...right here at the end of the rainbow. We had struck it rich and finally found a place where, once again, a house would became a home and where, once again, adventures would evolve! The offer, including some "upgrades" as the Pres calls them, was agreed upon!!! Yes, set on 3 and 1/2 acres, this will be our new home. A Quiet Corner has been found. You have trees....that means birds and wildlife..... Your new "corner" sounds wonderful. Do you have a completion date? Looking forward to having a fellow blogger from "The Quiet Corner", JP. Where is the new house located? Looks and sounds just right. Congratulations! What a cute place, and it'll be nice to have a place that is lower maintenance too. I'll be excited to see pictures as it progresses! I think it's going to be a beautiful house. When are you going to be able to move in and set about making it a home? Now that sounds very interesting. That house, (soon to be home)- seems to have everything going for it - except someone to call it home. I'm waiting with baited breath - just as I'm waiting for our move to the Laurentian 'wilds'. (Grin) ATB! Some things are really meant to be, and this one, certainly is!! It sounds perfect and I can't wait to see pictures of the new place you'll be calling home!! I'm sure your new place will be a blessing! So happy for you! What an exciting time! It looks wonderful! That is going to be really nice JP! I'm sure you will love it! We built our house. You are going to have a lot of fun picking out the different things you want in your new home. Can't wait to see more pictures of your new home! I guess you may want to add a facebook button to your site. I just marked down the url, however I must complete this manually. Simply my advice.